Monarch Air Group provides private air charter in Anchorage, AK. Our clients benefit from top-notch service, unrelenting dedication to safety, wide selection of aircraft, and years of experience in chartering private jets. To obtain a free quote, please use our online quoting tool provided below, or call toll free 1-877-281-3051. Monarch Air Group provides private jet charter flights in and out of Anchorage, Alaska, USA. Anchorage is the largest city in Alaska, a seaport on an inlet of the Pacific Ocean. 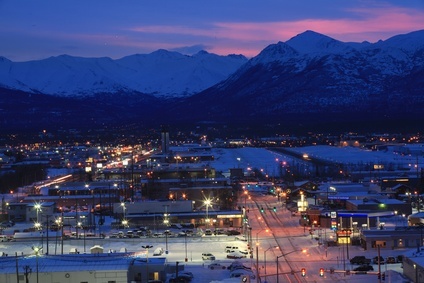 Anchorage is Alaska’s most populated city with a population of about 291,826 people. A total area of the city is 1,961.1 square miles. Its largest economic sectors are military, transportation, municipal, tourism, state and federal government, corporate headquarters and resource extraction. The most famous places of interest include Prince William Sound, Iditarod Trail Sled Dog Race, Tony Knowles Coastal Trail, Chugach National Forest, Alaska Native Heritage Center, Kincaid Park, Alaska Center for the Performing Arts, Visit Anchorage Log Cabin Visitor Information Center, and much more. The nearest airport is Ted Stevens Anchorage International Airport (ANC / PANC), which is located 6 miles from the center of Anchorage. 1. ANC, Ted Stevens Anchorage International Airport, Anchorage, United States. 2. AQY, Alyeska, Alyeska, United States. 3. BCV, Birchwood Airport, Alaska United States. 4. BGQ, Big Lake, Big Lake, United States. 5. BVU, Beluga, Beluga, United States. 6. EDF, Elmendorf Afb, Anchorage, United States. 7. ENA, Kenai, Kenai, United States. 8. FRN, Bryant AAF, Fort Richardson, United States. 9. JLA, Quartz Creek, Cooper Lodge, United States. 10. MRI, Merrill Field, Anchorage, United States. 11. PAQ, Municipal, Palmer, United States. 12. SKW, Intermediate, Skwentna, United States. 13. SXQ, Soldotna, Soldotna, United States. 14. TYE, Tyonek, Tyonek, United States. 15. WOW, Willow, Willow, United States. 16. WWA, Wasilla, Wasilla, United States. 1. Duke’s 8th Ave Hotel, 630 West 8th Avenue, Anchorage. 2. Quality Suites Near Convention Center, 325 West 8th Avenue, City, Anchorage (AK). 3. Embassy Suites Anchorage, 600 East Benson Boulevard, Anchorage. 4. Clarion Suites Downtown, 1110 W. 8th Ave., Anchorage. 5. Duke’s 8th Ave Hotel, 630 West 8th Avenue, Anchorage. 6. Quality Suites Near Convention Center, 325 West 8th Avenue, City, Anchorage (AK). 7. Embassy Suites Anchorage, 600 East Benson Boulevard, Anchorage. 8. Hampton Inn Hotel Anchorage, Alaska, 4301 Credit Union Drive, Anchorage. 9. Hotel Captain Cook, 939 W 5th Ave, Anchorage. 10. Westmark Anchorage Hotel, 720 West 5th Avenue, Anchorage.